He (or she, not really sure) looks cute and harmless – kind of like Barney with a horn, him/her/it/zee/zi/whatever it might be. Yet this little thing is geared to grab the imagination of our children and indoctrinate –and even intimidate – them in participating in the sexual revolution. Even the confusing gender symbol is placed over its private area! What kind of nonsense is this?! 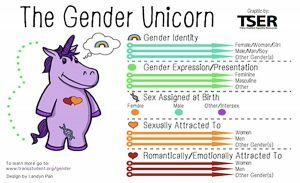 But it’s worse, because the purple unicorn was accompanied by an entire CMS Training presentation, where parent’s rights, teacher’s classroom gender references and even school activities have been completely redefined. 1) Parental involvement dependent on student’s permission: “Involvement of parents in the plan is determined in working with the student, considering the student’s age and health, wellbeing and safety concerns” (Page 34). 2) Students can choose their bathrooms and changing facilities: “Students must have access to the restroom/changing facilities that correspond to their gender identity” (Page 42). 3) CMS will remove some gender-based activities: “CMS will evaluate all gender-based activities; maintain only those that have clear and sound pedagogical purpose” (Page 46). 4) Students can choose their gender-based activities (intramural sports, dress codes, classes, ceremonies, photos, extracurricular activities, etc.). This includes choosing which gender they participate with during overnight field trips: “Students are permitted to participate in gender-based activities consistent with their gender identity” (Page 46). 5) Students shall not be referred to as “boys and girls” in classrooms, but “scholars” or “students”: “Avoid gender specific classroom management techniques” (Page 46). We can’t imagine what our nation will look like in 40 years – or 10 years, for that matter – if good, moral people don’t stand up and act now. It’s time pro-morality Americans, whether Christian or not, seek the common good of our nation and start speaking out against nonsense like what CMS is trying to push on our children. We also need Christians to shed the “we shouldn’t be political” cover and start running for local and state elections – especially school boards – to protect our children and the common-sense decency that allows civil society to flourish. What the heck are we waiting for?! It’s important to remember we are all created in God’s image – male and female. Though some truly struggle with gender confusion, for which there is abundant help and healing in Christ, we cannot exchange the image of God for four-footed animals like “The Gender Unicorn.” It’s disturbing we’ve fallen this far as a society.